Author(s): Maha M. Mahmoud, Wael M. Samy. Department of Industrial Pharmacy, Faculty of Pharmacy, Alexandria University, Postal Code 21521, Egypt. The use of different drug classes as host modulating agents has been postulated to have significance as an adjunctive remedy curing chronic periodontitis. In this study nano-structured films containing doxycyclin (DOX) were evaluated for such purpose. Nano DOX/chitosan particulate system was prepared using spray drying technique and was then incorporated in PVA-based films. The particles were evaluated for particle size, zeta potential and possible drug/polymer interaction. The films were also tested for in-vitro drug release and clinical efficacy compared with placebo and DOX-loaded films. The formed particles had a zeta potential of + 13.8 mV and particle size of 52.86 nm with a polydispersity of PDI=0.946. No significant drug/polymer interaction was detected by DSC thermal analysis. In-vitro DOX release was sustained for about a week with the nano-structured films showing 23% of the drug released compared with 44% released from DOX films. Clinical efficacy was done on 150 periodontal pockets from patients suffering from moderate chronic periodontitis. Following scaling and root planning they were divided into three groups; group I receiving nano-structured (DOX), group II receiving DOX and group III receiving placebo films. Evaluation was done both clinically and biochemically at base-line, 1 week, 1 month and 2 months following drug application. Clinical findings indicated a significant effect of both nano-structured and DOX films in improving the measured parameters compared with the control and placebo groups. Keywords: Chronic perodontitis, doxycycline, host modulating agent, nano-structured films, spray drying. Affiliation:Department of Industrial Pharmacy, Faculty of Pharmacy, Alexandria University, Postal Code 21521, Egypt. Keywords:Chronic perodontitis, doxycycline, host modulating agent, nano-structured films, spray drying. Abstract:The use of different drug classes as host modulating agents has been postulated to have significance as an adjunctive remedy curing chronic periodontitis. In this study nano-structured films containing doxycyclin (DOX) were evaluated for such purpose. 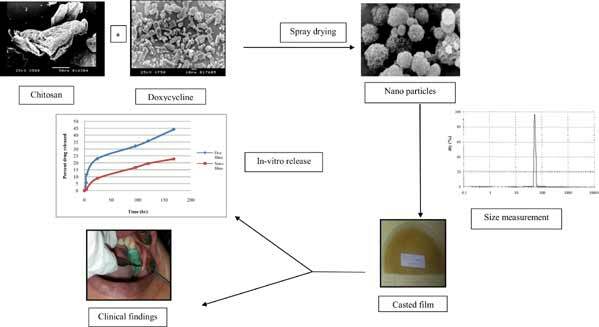 Nano DOX/chitosan particulate system was prepared using spray drying technique and was then incorporated in PVA-based films. The particles were evaluated for particle size, zeta potential and possible drug/polymer interaction. The films were also tested for in-vitro drug release and clinical efficacy compared with placebo and DOX-loaded films. The formed particles had a zeta potential of + 13.8 mV and particle size of 52.86 nm with a polydispersity of PDI=0.946. No significant drug/polymer interaction was detected by DSC thermal analysis. In-vitro DOX release was sustained for about a week with the nano-structured films showing 23% of the drug released compared with 44% released from DOX films. Clinical efficacy was done on 150 periodontal pockets from patients suffering from moderate chronic periodontitis. Following scaling and root planning they were divided into three groups; group I receiving nano-structured (DOX), group II receiving DOX and group III receiving placebo films. Evaluation was done both clinically and biochemically at base-line, 1 week, 1 month and 2 months following drug application. Clinical findings indicated a significant effect of both nano-structured and DOX films in improving the measured parameters compared with the control and placebo groups.